What a 1996 telephony magazine tells us about the past, present, and future of communications technology. Every spring for the past 55 years, the homeowners on both sides of my block have gotten together to clean our alley from one end to the other. 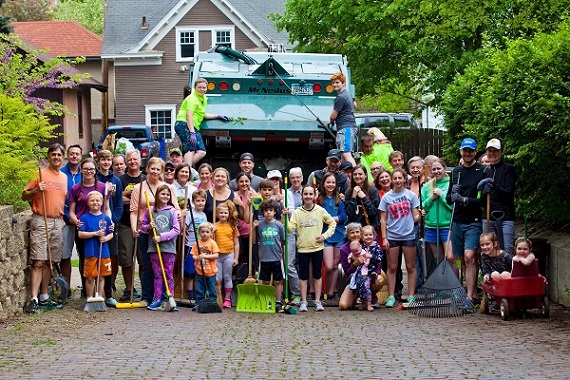 With our brooms, rakes, shovels, clippers, and trash cans, we work as a team to find and dispose of every last scrap of debris and yard waste. To complete the day, we gather again in the evening for a potluck dinner in our newly immaculate alley. As strange as it might sound, this is one of the social highlights of my year. As part of the decluttering process, this year I did some spring cleaning of my own and rooted out quite a bit of trash and unnecessary treasures from my extremely messy basement. 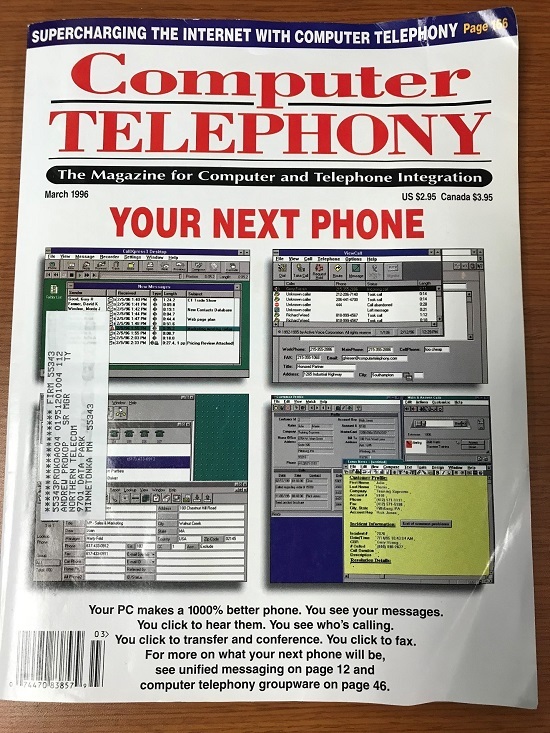 One of those treasures was a March 1996 copy of Computer Telephony magazine. For those of you too young to remember Computer Telephony, it was once the source of information for the burgeoning field of unified communications. It was where most of us old-timers learned about everything from Microsoft's initial foray into telephony -- Telephony Application Programming Interface (TAPI) -- to the latest and greatest voice processing board for our IBM XT computers. At a glance, I was immediately struck by a number of things about this particular issue. First, the entire cover was filled with tacky images of PC softphones. While I'm sure that they were not cheesy looking in 1996, by 2018 standards those user interfaces look as dated as a pair of bell bottom pants. The gray backgrounds and oversized icons all scream Windows 95. Next up was the exuberance the magazine expressed over the idea of making a phone call from your PC. Not only does Computer Telephony claim a softphone is better, it claims it's a 1000% better. Exactly how the editors came up with that number is left unsaid, but they are clearly excited about this "revolutionary" technology. Last was the phrase "unified messaging." Is that term really 22 years old? In an industry that changes the names of its creations on an almost daily basis, I find it amazing that we still describe the concept of visual voicemail using the exact same words. Opening up the magazine brought on a wealth of eye-opening moments. Have you heard of Halycon? No? How about Intelnet, Sim-phony, Ariel, or Centigram? I haven't. Page after page is filled with advertisements from companies that have all now gone belly up. From the look of their ads, you wouldn't know that these companies would all disappear without a trace. Seriously, how can the company that introduced "a new dimension in computer telephony platforms" no longer be with us? Wouldn't you think that a product that can "see into the future" would still be around now that the future has actually arrived? But marketing superlatives are no guarantee of longevity; clearly, communications is a volatile industry. I was also surprised by the lack of webpages for some of these companies. It wasn't as if the Web hadn't already been around for several years in 1996. Even giants like AT&T spent big money on a full-page ad that included an 800 number, but no URL. The articles were quite fun to read, too. There were numerous mentions of fax -- and not in terms of getting rid of it. The writers embraced what we now consider an archaic technology that is long past the point of retirement. Sadly, it was still considered essential in 1996, and everybody seemed downright giddy about it. There were also a lot of mentions of the PBX. Nearly every article was PBX-this and PBX-that. I even saw "Central Office" thrown in every so often for good measure. Clearly, this is long before the race to the cloud when everyone was still thinking about on premises and big iron solutions. My favorite article was the cover story about all those "1000% better" PC softphones. With names like WebPhone, WorldFone, WebTalk, ZTalk, E-Phone, VideoPhone (in stunning black and white), Speak Freely, PowWow (really? ), and NetPhone, you would think they all had something unique to offer. Sadly, they nearly all did the exact same things. However, that didn't stop each company from claiming that its software was the best. Most were Windows applications (3.1 or greater), a few ran on a Macintosh, and I even read about one that only worked on Linux workstations -- does anyone actually use a Linux workstation anymore? No matter what the platform, though, they all had ugly interfaces. DTMF was still king, and most of the screen real estate was taken up by a huge dial pad. SIP was still a few years away, and if you wanted to call someone, you had to have a telephone number. No dial-by-name for these applications. Heck, I am not even sure how many did click-to-call. Oddly, not a single product mentioned in the article came from an actual PBX vendor. There was nothing from NEC, Northern Telecom, Lucent, or Siemens. Heck, there wasn't even a mention of the old key systems like Executone or Comdial. This was clearly the space for startups. In the end, there is no great moral to this story. Technology advances rapidly -- I get that. What I am doing today, will probably seem old fashioned, quaint, and downright ugly tomorrow. Still, there are many threads that exist today. While you are not about to install CyberPhone (at the ridiculously cheap cost of $20) on your Windows 10 machine, you won't think twice about Skype for Business. However, they both essentially do the same thing. The underlying protocols are different and the user interfaces might be night-and-day prettier, but you are still "making telephone calls." Everything old is new again. Like Steve Miller, I too want to "Fly Like an Eagle," but this magazine has forced me to recognize that for the past 22 years, I have basically been doing the same thing. I've replaced analog with SIP, dial-up with wireless, and CompuServe with Gmail; yet I still use my fingers and mouse to call my coworkers. Sigh. Perhaps that company that claimed to "see into the future" wasn't so far off after all. Turns out the future looks an awful lot like 22 years ago.